No - that is something that you get when you pay for the B&O solution. In the above case, I wouldn’t really know what to enter on a B&O tv.....it is Penta, yes - but not really, because there is the ICE Power module in between. Another problem would be to enter the right distance in the setup . Must it be the distance to the Receiver 1/s or to the actual speaker/s??? Good point, actually! I guess no other way but to enter one value, listen to the setup and then enter the other and listen again. Whichever sounds better and more natural should be the right one. R and L in the LG TV. I would like to keep my ICE / BeoVox Penta setup. So I hope it's the way to do it. If this works as I hope, we can also use earlier versions of active BeoLab speakers. 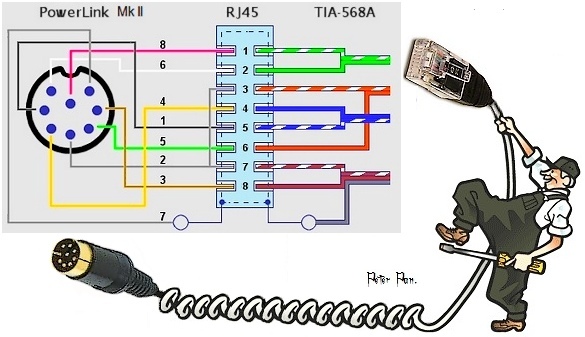 If you want to make your own adapter cables, there is help here. Wireless WiSA speakers on LG OLED. 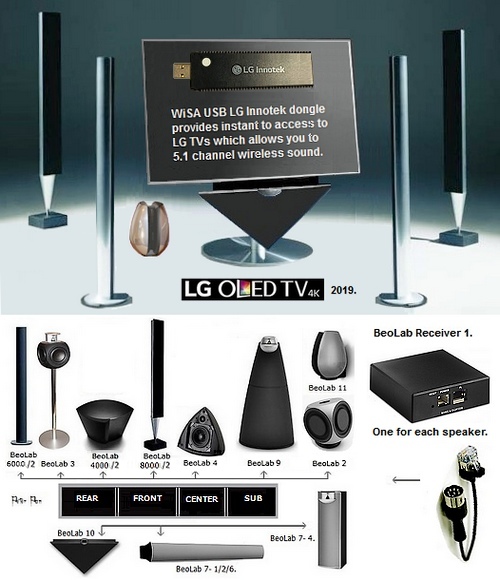 It is possible to connect wireless B&O speakers to a LG OLED TV. By Lars Ladingkær. January 2018. Any idea on the quality of the surround sound processor in the LG tv? It has to handle the time delay (for distance) and crossover frequency allocations for each of the speakers. time delay (for distance) and crossover frequency allocations for each of the speakers. BeoLab 18. 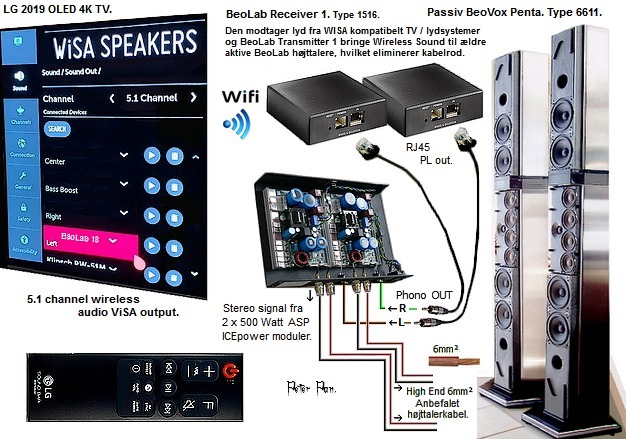 Or from BeoVision Avant, over a BeoLab Receiver 1 to BeoLab 9, without time delay. 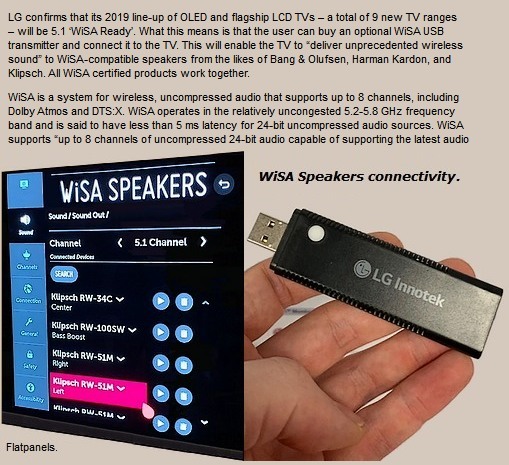 WiSA new wireless system over WiSA Ready / dongle in a LG tv 2019 is described here. Obviously Peter Pan did not understand your question. As far as I know, there is only a very basic setup procedure with the WiSA Ready implementation in the LG’s. We will know for sure, when the first people try it out. It surely will not be anything that you can compare with a fullblowwn audio processor, like the one in the B&O WiSA-tv’s. Most people don’t care for or notice the suble things a quality audio processing may add to the mix. But - again....let us see, when the results with the first setups with WiSA BeoLabs will come. Now Millemissen has been negative right from the start. Remember this is an alternative when B&O has sold their last BeoVision TV. I’m not sure if the following questions have been already replied in this long thread, in case my apologies. 1) When is it expected to have the LG WiSA stick available in the market? 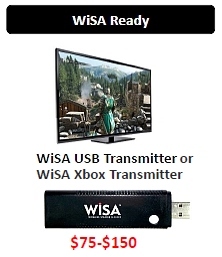 3) What if this dongle is connected to a non-WiSA BeoVision? Would it make it the same as a more recent BV WiSA-equipped set or would we have some trade off? Would it make a B&O Transmitter redundant? 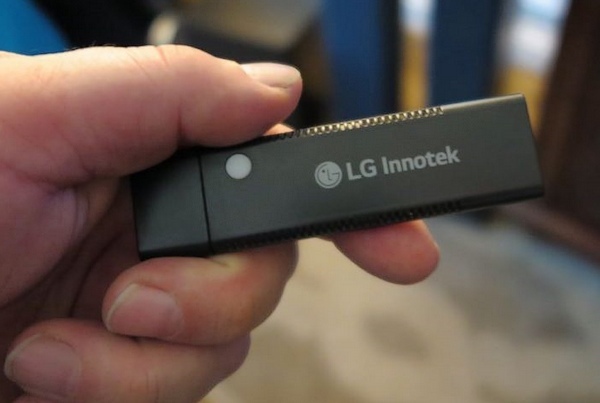 1: don’t know exactly - but I guess with launch of the 2019 LG/OLED’s. 2: no idea, but not that expensive, if I remember correct. 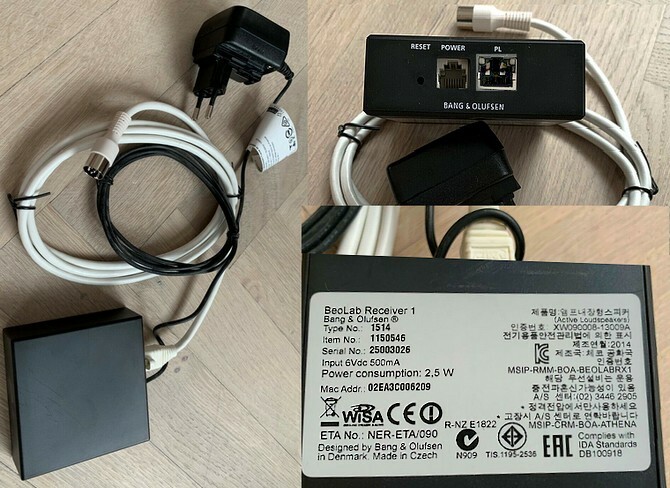 3: You can only connect this dongle (means use with) a tv, that is WiSA Ready enabled. Means there must be a special software on the tv (like with the 2019 LG’s) in order for this to work. There is no way what so ever that this could work in a B&O tv. .....or just wait for more information, when the 2019/LG’s are rhere. From November 2018. Download WiSA PDF - Click here.